I’ve made a series of paper collages to sell at #Tattoo4Tonga this weekend. I was inspired after a visit to the Auckland Museum storeroom where I spied some exquisite Fijian breastplates kept in dark little drawers. Being so close to them without a glass cabinet between us, I felt attached and energised by them; I’ve been intrigued with Fijian breastplate design for a long time. Although I was able to photograph them, I was asked not to share the imagery. I loved encountering these beautiful objects and wanted to tell the world! As a social media creature, I found this proposition quite challenging… so, this series came about. A paper entitled, Uncharted Histories of Ivory Carving Canoe Builders and Canoe Building Ivory Carvers in Western Polynesia, delivered by Steven Hooper at the Pacific Arts Association International Symposium in Vancouver last year gave me a deeper appreciation for the construction of Fijian breastplates. The Chiefs & Governors: Art and Power in Fiji exhibition catalogue published by the Museum of Archeology and Anthropology at the University of Cambridge (UK) has also inspired me. I long-term borrowed it from my parents on a recent trip to Suva, where I also made a quick visit to the Fiji Museum. I love observing the ways in which Fijian objects are kept, discussed, displayed and valued in these very different contexts. These paper breastplates were created thinking about where these beautiful objects live, in the Auckland War Memorial Museum in New Zealand, thousands of miles from where they came from. I was thinking about value and values, Fijian value and non-Fijian value. And imagining what repatriation would feel like, and in an ideal world, what the Fiji Museum could house and display if they had the resources and leadership of larger international museums. The works I made use pages of magazines and journals about Auckland, Renaissance art, American muscle cars, contemporary art, oceans, Fijian arts and culture and the Bible. This series, made specifically for the #Tattoo4Tonga event, measure approximately 250x250mm. They’ll be framed and sold for NZD100 each. All proceeds go towards Cyclone Ian relief in Ha’apai, Tonga. Leilani Kake and I had a stall at the GROUNDED Festival of Sustainable Arts pop-up market last weekend, hosted by Manukau Institute of Technology’s Faculty of Creative Arts in Otara, South Auckland. The #2girls1conference fundraising campaign t-shirt is designed by senior student, Tepora Malo, currently studying to complete a Bachelor of Creative Arts. Tepora undertook an internship with Leilani and I on the #2girls1conference campaign, overseeing the process of crowdfunding, social media marketing and leading the design and hand-printing of the limited edition t-shirt. Tepora’s design employed a complex printing process that presented a fairly massive learning curve for all involved! The outcome is gorgeous and represents multiple hours of trial and error, laughs, sweat and tears! We produced a limited range of 70 t-shirts and 20 canvas tote bags – both are selling fast; sales enquiries can be directed to Ema using the Contact page here. The PIMPI fans are seasonally misguided, but on sale for NZ$60. Images courtesy of MIT Faculty of Creative Arts. 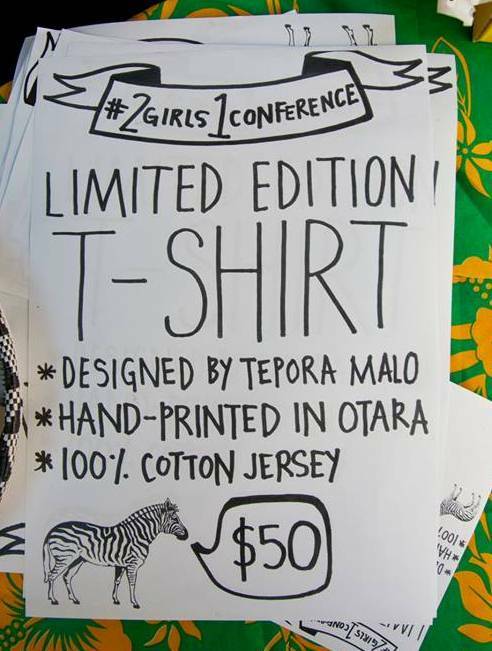 #2girls1conference Limited Edition Art T-shirts, proudly made in #SouthAuckland! Leilani Kake and my fundraising efforts to get to the Pacific Arts Association International Symposium in August are gaining real momentum! A 25-day campaign on the New Zealand crowdfunding website, PledgeMe was an enormous success – we were overwhelmed with the support from our communities and networks on and offline. This initial fundraising effort attracted over $4000 of support which covers the bulk of our return airfares to Canada! A HUGE Thank You to everyone who pledged, shared, liked and retweeted to support our cause. Part of our fundraising effort has been the design and production of a limited edition art t-shirt which we were able to hand-print using the excellent facilities at Manukau Institute of Technology. Tepora Malo, a third year student studying at the Faculty of Creative Arts worked as our intern on the project – we all learned a lot about the four color printing process and talked for long hours about art making and money making. Otara artist, activist and recent graduate, Amiria Puia-Taylor was our first choice to model the t-shirt for us. Her position on community awareness and artistic empowerment is particularly refreshing and she definitely represents the concept of REAL TALK! We also benefited from the very promising expertise of first year student, Sean Atavenitia who created our promotional photography. The whole initiative has been a really rewarding, Made in South Auckland experience! The limited edition #2girls1conference art t-shirt is on sale now for $50! We also have a limited amount of canvas shoulder bags for $30 and $15 repurposed jumbo tote bags from the slightly imperfect printed t-shirts! Come find us at the GROUNDED Festival of Sustainable Arts Pop-Up Market from 10am – 5pm on Saturday 29 June, 50 Lovegrove Crescent, Otara, South Auckland, or click here to submit a sales enquiry. We’re blown away with the support for the #2girls1conference campaign currently running on PledgeMe! Every dollar pledged is helping Leilani Kake and I with travel and participation costs for the 11th International Symposium of the Pacific Arts Association in Vancouver this coming August! We’re less than $500 away from hitting our crowdfunding target with 12 days still to go. We’re hoping the #2girls1conference campaign (including crowdfunding, art t-shirt and auction) will generate a minimum of $6000 in total, so every dollar we make on PledgeMe effectively takes a little bit of pressure off our other fundraising initiatives. We’ve had a great week generating awareness for what we’re doing; on Tuesday, Adrian Evans‘ piece in the Manukau Courier was published. We were reminiscing about our 2009 lecture tour to California and smiling about how many times we refresh the browser permanently open on PledgeMe! On Wednesday we joined Yolande Ah Chong, the excellent and thoroughly conscious and informed host of Radio531pi‘s Breakfast with Lande show to discuss art making, Pacific audiences, leadership and crowdfunding. It was an awesome opportunity to really thrash out some of the principles and beliefs we have about why Pacific art and South Auckland are important. The #2girls1conference T-shirt is getting lovingly hand-printed next week using Manukau Institute of Technology’s excellent print studio facilities at the Faculty of Creative Arts. Tepora Malo, a third year student completing the Bachelor of Creative Arts programme, has been an excellent collaborator and intern on this project. We’re excited to be working under her leadership in the printing process. And we’re absolutely humbled by the generosity of our artist friends who have committed works for our auction! We have some AMAZING pieces that have been part of recent South Auckland and Pacific Art History! A stunning large scale unframed photograph by Tanu Gago, part of his Avanoa o Tama (2012) series and a beautiful suite of video stills from Rebecca Ann Hobbs’ work, Otara at Night. Painters Margaret Aull and Nigel Borell have also donated works and the invitation to make or donate works for the cause also inspired this beautiful collaboration between Molly Rangiwai McHale and Luisa Tora! Every dollar raised in the #2girls1conference campaign is making us feel more and more excited and empowered knowing that our papers at the Pacific Arts Association in August are supported with massive love and investment from our networks! To keep up to date on #2girls1conference campaign and our journey to the PAA, connect on Twitter, Facebook or subscribe to PimpiKnows.com for email updates! 2 GIRLS 1 CONFERENCE is the name a fundraising campaign to support Leilani Kake and I to travel to Vancouver, Canada to present papers at the Pacific Arts Association (PAA) 11th International Symposium. The theme of the event is, Pacific Intersections and cross currents: uncharted histories and future trends. The PAA regards their gatherings as opportunities for contemporary artists, cultural leaders, historians, museum and gallery curators, researchers, and collectors to engage in lively and creative dialogue in the spirit of true enquiry. We have presented before with the PAA, and in 2010 travelled to Rarotonga, Cook Islands to participate in the 10th International Symposium. 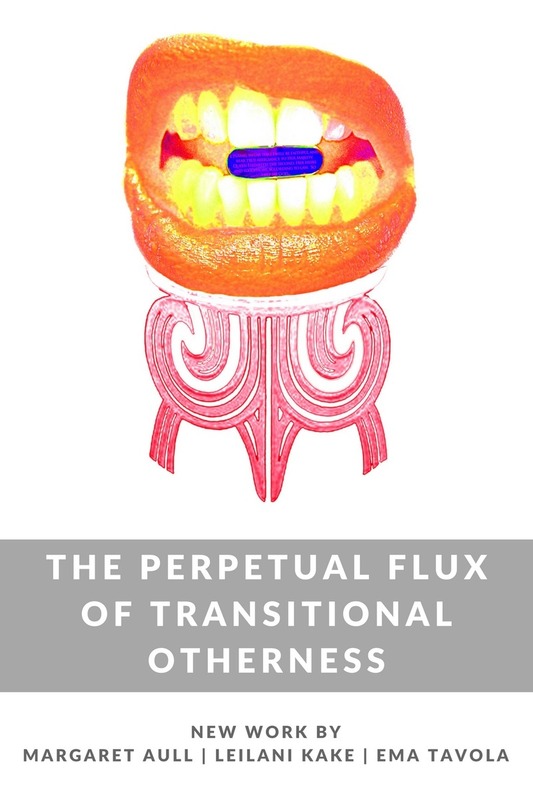 This year Leilani has proposed to discuss her video installation practice in the context of recent research into intercultural identities. I’ve been invited to contribute to a panel entitled, “Curating Pacific Spaces: The New School of Contemporary Pacific Art from New Zealand”. Having collaborated on international travel, lecture tours, exhibitions and events since 2004, we have built our *award-winning* art practices on strong networking, bold advocacy, a genuine sense of service to our communities and lots of love, sweat and tears! In the past we have attracted support from a wide range of organisations for our collaborative endeavours, but this year we have both returned to full-time tertiary study and arts-related funding for various reasons has been out of reach. 2 GIRLS 1 CONFERENCE is our all or nothing effort to get Pacific art and South Auckland on the PAA radar. The campaign goes live on Sunday 26 May – a heartfelt acknowledgment of Fresh Gallery Otara’s 7th anniversary, a timeframe that had been historically marked with poignant locally inspired exhibitions, hearty celebration and the opening of the annual Pacific Arts Summit (between 2010-2012)… until this year. Leilani and I want to recognise the humble beginnings of this important South Auckland arts hub with a reminder of the original kaupapa – to generate awareness and engagement with South Auckland’s unique cultural landscape. On Sunday 26 May, our PledgeMe campaign goes *live* and our efforts to hustle and share to the best of our abilities will go into overdrive! Whilst we are two individuals travelling to one conference, we represent a community of hard-working artists and the massive interconnected network of Pacific people who sustain and inform them. 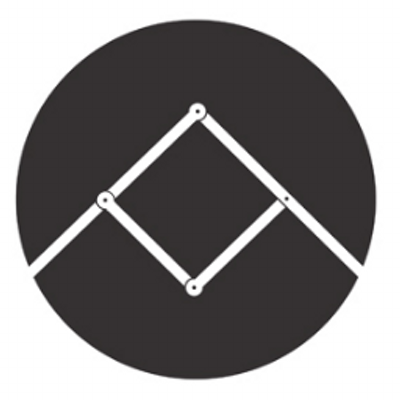 Our participation is about representing our collectives, making South Auckland visible and engaging new audiences with our vibrant and unique arts and culture. In the past two months I’ve come across a range of art products produced by entrepreneurial Pacific artists – something I love to see! Imagine if entrepreneurship and small business skills were taught at art schools! I love supporting artists who have a head for money-making! Magnets, bags, lavalava and t-shirts… here is a small selection of some Pacific creative practitioners hustling in Auckland today! FAF SWAG is an online LGBT community honouring Samoan fa’afafine identity. FAF SWAG t-shirts and lavalava are designed by Samoan new media artist, Tanu Gago. Tabana by Design is a collaboration between Martine Stowers and her father. They have collectively produced a range of homeware, totes and make-up bags. They are GORGEOUS! The Good, The Bad is the brand of Samoan artist Gary Silipa. I’ve been a fan of his work for a while and love his TGTB Symbol t-shirt. Tepora Malo is currently completing a Bachelor of Creative Arts at Manukau Institute of Technology. In 2012, she printed a series of lavalava and sold them at Otara Market. I came across them and loved them straight away! She now stocks Mangere Arts Centre shop located at the corner of Bader Drive and Orly Ave, Mangere, South Auckland. Molly Rangiwai McHale produced a series of magnets featuring illustrations for Auckland’s recent Big Gay Out festival. The new YOU LOVE MY FRESH t-shirts are in and ready to sent out into the world. This is the first of a series of art t-shirts produced by PIMPI on behalf of exciting South Auckland and Pacific artists. 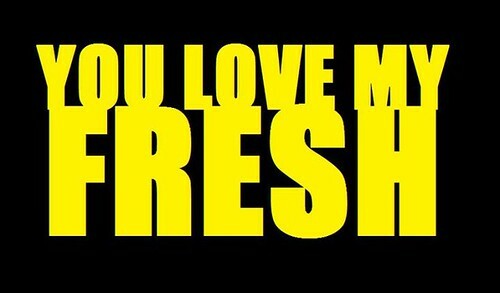 YOU LOVE MY FRESH is the name of Samoan new media artist, Tanu Gago‘s first solo exhibition held in 2010 at Te Tuhi Centre for the Arts in East Auckland. The exhibition consisted of a three-channel video installation incorporating animation, documentary and performance. 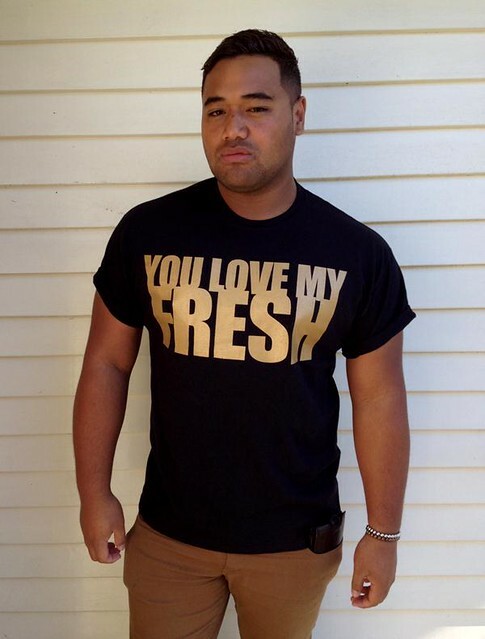 YOU LOVE MY FRESH limited edition T-shirts are for sale for NZD40, contact Ema for more information.